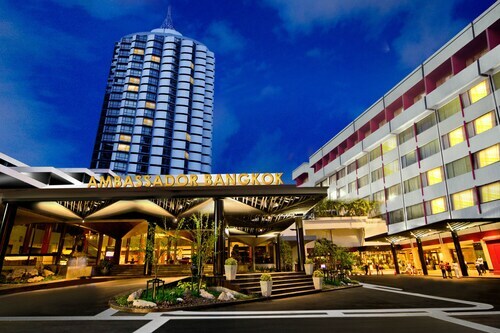 Very nice hotel in the busy district of Bangkok. Highly recommend to anyone who's visiting Bangkok. Great hotel, 10 minute walk to the Chong Nonsi BTS station. Good location, professional staff, good rooftop bar with outstanding view. Guests often come to Thailand hotels humming "One Night in Bangkok" or "Getting to Know You," but there is so much more to this country than Chess or The King and I have to show us. Thailand has alternated between the names Siam and Thailand several times over its history, but the temples and natural wonders people come to see really do exist in abundance. Thailand is now known in the West for wonderful spicy foods and Buddhist temples both small and large. Add in the fantastic beaches and travelers come from all over looking for the best accommodations in Thailand hotels to get most out of this exotic and beautiful country. Thailand is a long and narrow country with regions that include a northern border with Myanmar and Southern Thailand with its famous beaches at Phuket and Krabi. Visitors looking for luxury hotels in Thailand often visit Phuket or the city of Bangkok. From visiting the temples (wats) to learning to scuba dive, Thailand seems to have it all—the exotic to the domestic. In Phuket, you can lounge on the beach in front of your hotel or you can visit WatChalong, a beautifully maintained Buddhist temple on the road to Rawai Beach. In Bangkok, guests can visit Wat Pho to see the famous reclining Buddha (the largest in Thailand) or you can sample the modern Paragon Cineplex and see the latest movie in air-conditioned comfort. Because of the hospitality of the local people, hotels in Thailand are friendly and welcoming places, so travelers in Thailand can enjoy any level of accommodation from the most basic Amata Resort in Phuket to the luxury Tower Club in Bangkok. After that, visitors can slip off the beaten track to the north into the Isaan region and visit the Khmer ruins and rain forests. Convention centers are usually located in hotels in Thailand. 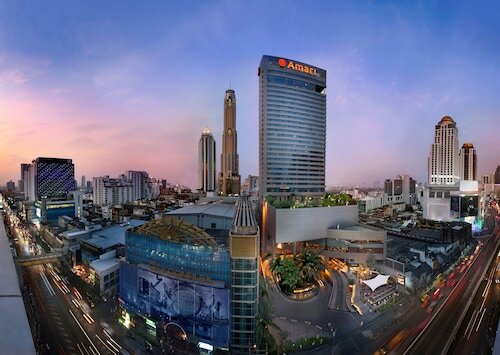 One of the biggest is the Bangkok Convention Center at Central World. Thailand is known for its spicy foods, and despite marketing hype, "Royal Thai" foods are really just the same as those served to the rest of the country, though with fewer extremes of taste, and no bones at all. Visitors to Bangkok shouldn't miss the Grand Palace, or Wat Phra Kaew. From the gigantic tiled walls and doors that are extremely photogenic to the monks' area where photography is not allowed, this location encompasses the history of Thailand. The Thai people love shopping. There are large retail centers, and smaller local markets all over the country. One of the best is the Chatuchak Weekend Market in Bangkok, where the shopper can find everything from second-hand clothing to food to small animals. Thai sports are different from those anywhere in the world. A favorite is Thai Boxing, (Muay Thai), and you can find at least two fights a week in Bangkok. In the field of western sport, soccer is just beginning to catch on, but volleyball is well-loved and played often. This is and older hotel that is in ok condition. The rooms smell a little but are still nice. This is also the number one hotel for Indian tourists so I felt like I was in India when staying at this hotel. At breakfast there were about 150 people and me and a friend were the only white people in site. Work out room in big but a little outdated equipment. They did have treadmills and bikes that were nice.